The Alvin Creative Center Drafting Combo provides everything you need to set up your work station right out of the box! 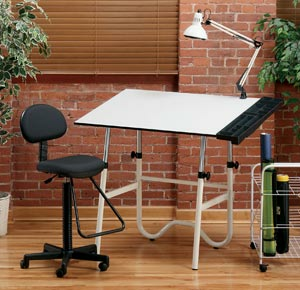 The set includes an adjustable height work table, pneumatic drafting chair, swing arm lamp and attachable storage tray. The drafting table folds for storage. This drafting work station comes as a complete four piece set which includes the drafting table, pneumatic chair, swing arm lamp and table caddy. The drafting table has a white base and a white Melamine® work surface. The top measures 30" by 42" with an adjustable angle of 0° to 45°. Table height is also adjustable from 29" to 44" allowing you to customize the table to the perfect height for you. The table can be folded for storage. The black pneumatic drafting chair has an upholstered seat and backrest, caster wheels and a teardrop footrest. The pneumatic mechanism allows you to adjust the height between 23" and 29". The swing arm lamp attaches directly to the drafting table and takes a 100 watt bulb. Spring arm extends to 32". A sturdy black storage tray has numerous compartments for keeping all of your supplies close at hand. Attaches easily to either the left or right side of the table.